Investors will be hoping for a rebound performance for the Dow Wednesday as corporate earnings remain in focus. U.S. stock futures were slightly lower ahead of the opening bell. Markets diverged Tuesday, with the Dow falling while both the S&P 500 and Nasdaq moved higher. IBM (IBM) shares fell in premarket trading after the company issues a weak first-quarter outlook, despite beating earnings and sales estimates in the fourth quarter. Shares of Advanced Micro Devices (AMD) tumbled after the company's guidance for the current quarter fell short of expectations. Blackberry (BBRY) shares surged after the smartphone maker said it was unloading the majority of its Canadian real estate. eBay (EBAY) and Netflix (NFLX) are on deck to report results after the closing bell. Overall, earnings are expected to be up 5.9% in the fourth quarter for the companies in the S&P 500, according to FactSet Research. 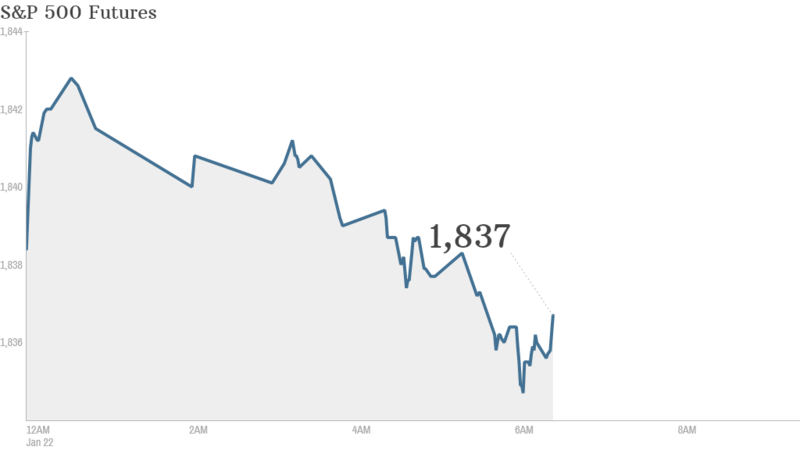 Stocks have been off to a rocky start in 2014. After last year's big rally, investors are looking for signs the economy will be strong enough to keep the bull market going. But with little economic data on the agenda this week, investors are turning their attention to fourth quarter earnings from big U.S. corporations. Asian markets closed higher across the board, led by the Shanghai Composite, which advanced 2.2% as interbank lending rates fell for a second straight day. European markets opened the day in positive territory but reversed course by late morning.